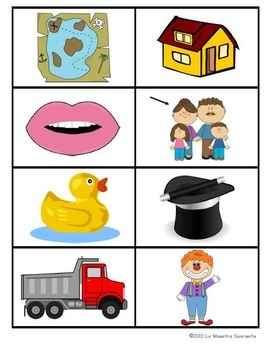 This 11 page document contains an initial syllable identification game in Spanish. 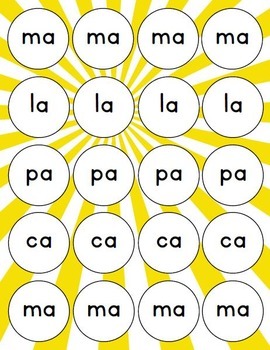 The game focuses on syllables that contain the letter a, specifically ma, pa, ca, and la. The product includes one game board that can be used to play two games: syllable bump and connect four. The product also features more than 40 picture cards that feature objects that begin with the target syllables. Students play these games in groups of 2-3. 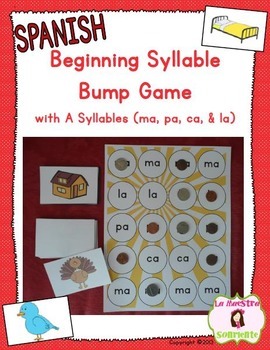 While playing, students will learn to hear the initial syllables in words while also practicing reading syllables. My students love these games and always ask to play them more! These games make for a perfect literacy center, free choice activity, and can even be sent home for students to play with their families again and again.